possible for the cancer support services and The Wicklow Hospice. This year there will be 12 main venues dotted around the county with live music and celebrity guests. We also have our annual table quiz on Thursday26th April at 7.30pm in Bray Golf Club. 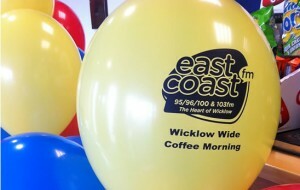 A special coffee morning in Blessington is still to be announced, so keep your eyes on our Facebook page and ears listening to East Coast FM. Plus over 50 businesses are also holding mini coffee mornings for their staff, customers and many school are holding events for their students. Marathon. To join our team, email Clare Hogan on [email protected] or call 012724700. Musical guests include: Jake Carter, Luan Parle, Remedy Club, The Swing Cats and Denise Brennan and Michael Flood. Plus there will be magicians, Colm Dawson, Joe Daly and John Gerard Magic.